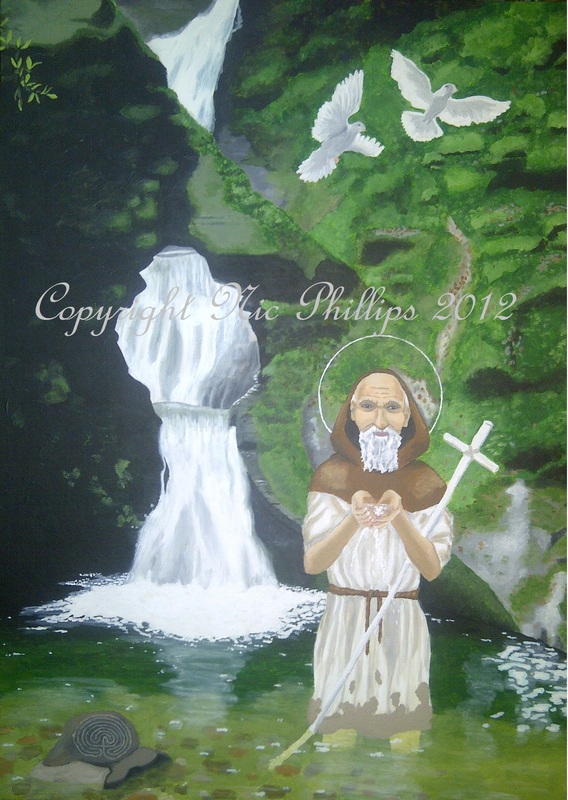 This is the 6th Century Saint, Nectan, pictured beneath the waterfall in Cornwall called St Nectan’s Kieve where he was said to have a hermitage. To the left of him is the labyrinth pattern found carved on rock at nearby Rocky Valley, Tintagel. His actual residence was further up the coast at Hartland where the church is dedicated to him but the association with the glen and kieve is an enduring and popular one. He was the brother of Morwenna, and many other Welsh saints who migrated to Cornwall. Acrylic on canvas (19.5in x 27.5in).